Crown of Life Christian Academy held a ribbon-cutting ceremony at the conclusion of its first full day of classes at Fort Atkinson’s Bethany Evangelical Lutheran Church on Wednesday. The Academy’s mission is to serve its community through the proclamation of God’s Word, the pursuit of academic excellence, and the establishment of meaningful relationships with the children and families it serves. 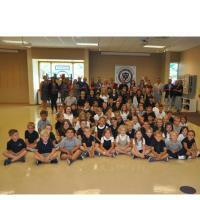 The new parochial school opened its doors with 123 enrolled students from 2K through 8th grade. Oppermann said that includes 77 enrolled in kindergarten through eighth grade and 46 in pre-kindergarten. Locally, Bethany Lutheran Church has been involved in Christian education for 75 years in a partnership with multiple Lutheran churches. The academy has been in planning since July 2017 when Bethany began narrowing its focus for carrying out Christian education. It currently is housed at 404 Roosevelt St., in the education wing of Bethany Ev. Lutheran Church (WELS). Each of the nine classrooms is being utilized, including a departmentalized rotation for students in grades 5-8 and a resource room for specials and extra-curricular activities. Pupils in all pre-kindergarten and kindergarten classes have separate rooms. Each grade level — 2K, 3K, 4K — has its own teacher, and then an aide based off the criteria from the state with teacher-pupil ratios. Classes for grades 1-8 are divided into grades 1-2, 3-4, 5-6 and 7-8. Each has one teacher, with some departmentalized teaching occurring as well. In a partnership with CrossFit Fort Atkinson, Crown of Life will provide students with a specialized Youth Empowerment Program, aligning with the physical education curriculum, despite the lack of a gymnasium. Student opportunities include athletics, band, forensics, drama and community-focused events throughout the year. In lieu of a gym, the newly renovated outdoor playground and fellowship hall will serve as a recreational space for the students. The Fort Atkinson Chamber of Commerce held the ribbon-cutting ceremony for Crown of Life Christian Academy on Wednesday. Students, families, community members and staff were on-site for the ceremony, marking the academy’s first full day of classes. “It was a really fun and exciting thing to be here today for the Crown of Life Christian Academy,” Fort Atkinson City Council President Mason Becker said. A lifelong member of Bethany Lutheran Church, he said it appears the community is excited to have a little bit different option for elementary education in Fort Atkinson. During development of the concept, Becker served as the church council secretary. “Two years ago this was not something anybody in our church was envisioning but as events happened in our church relationships, it became a noted need that the best path forward was to start our elementary school,” Becker said. City Manager Matt Trebatoski agreed. From a city standpoint, he said it was exciting for the community to have another education opportunity. Meanwhile, Oppermann said plans for building a new school in Fort Atkinson are ongoing. Crown Academy’s efforts in a potential land purchase also are continuing. The site under consideration is 40 acres north of Montclair Place on the northwest side of the city. The State Highway 26 bypass is the western boundary of the site and the southern boundary is Montclair Place. The property once was owned by the Allen and Doris Hetts family as Crescent Beauty Farm and portions remain under the CBF Investments Lexington Center ownership. Crown of Life Academy has an offer to purchase the 40-acre parcel with no designated timeline currently in place. Phase One would include the gymnasium, the initial set of classrooms, a baseball diamond and soccer field development. A second phase would include space for additional classrooms and further expansion of the facility to include a large commons/cafeteria area. A capital campaign has raised approximately $1.7 million, allowing Crown of Life Academy likely to move forward with acquisition of property without borrowing any funds. The process advanced in late June when the Fort Atkinson Planning Commission approved a preliminary certified survey map. Subsequently, last week the commission approved a conditional use for construction of a school at the site. Oppermann said further discussion will be had internally by the church’s Land-Building Committee before it is brought to a vote by the church council and then, ultimately, the entire congregation. The dean suggested that the congregational vote could be undertaken in the “near future” without offering a clean definition of that notion. He noted that the concept is to open the site not only as a school but for general community use in terms of facilities including the building and baseball and soccer fields. Anyone with questions is welcome to visit the school’s website at www.crownoflifeacademy.org or contact them by telephone at (920) 563-2278.